This holiday season, invest in SFC & support healthy, local food for everyone in our community. This holiday season, I have been reflecting on what healthy food means to me and my loved ones. Providing fresh, whole meals for my family brings me peace of mind and a sense of security that those dearest to me will be nourished throughout the year. But as I sat around the table sharing a meal with my family, I was struck by the thought of our countless neighbors who struggle to find access to fresh, healthy food on a daily basis. With your help, we are able to fight the barriers to healthy food by providing innovative programming like school & community gardens, farmers' markets & work place farm deliveries, and free cooking & nutrition education classes. December 31st is your last chance to make a tax-deductible gift this year. 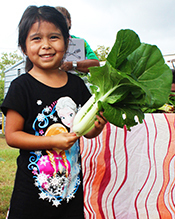 Your gift, made before 2015 comes to a close, helps build a food-secure Austin where all children and adults can eat healthy, local food for the year to come. Please give one last gift this year to support a healthy future for everyone in our community. Tell a friend about this campaign and spread the spirit of giving this holiday season.